The company has announced a new revenue guidance of 8 to 9 per cent in constant currency against projections in the range of 10 to 11.5 per cent made in the last quarter. IT blue CHIP Infosys has reported a 6.12 per cent rise in consolidated net profit at Rs 3,606 crore for the quarter ended September 2016 against Rs 3,398 crore in the same period of last year. However, the company slashed the revenue outlook for the fiscal year ending March 2017 as customers are holding back on spending ahead of US presidential election and Brexit drama in Europe. The company has announced a new revenue guidance of 8 to 9 per cent in constant currency against projections in the range of 10 to 11.5 per cent made in the last quarter. Infosys shares fell 2.34 per cent to Rs 1,027.40 on the BSE on Friday. Revenue from operations rose 10.71 per cent to Rs 17,310 crore in the September quarter as against Rs 15,635 crore previously. On Thursday, TCS had reported a growth of 8.44 per cent in net profit while its sequential revenue showed a growth of just 0.1 per cent. 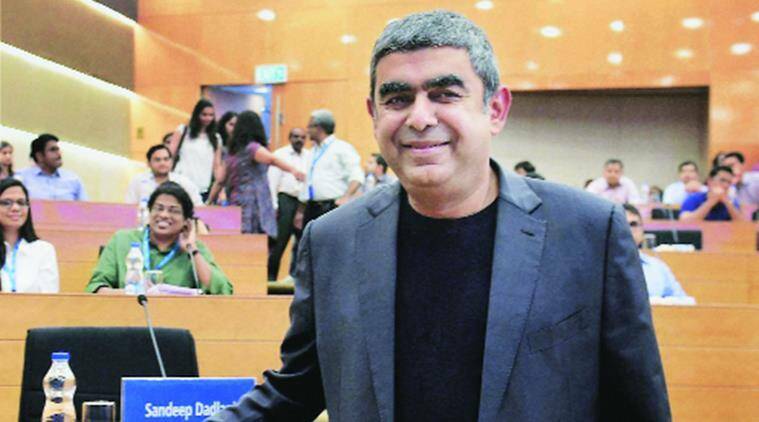 $2,587 million and in constant currency a little short of 4 per cent,’’ Infosys CEO Vishal Sikka said on Friday. WATCH VIDEO: Explained: How Will GST Work? “On margins we grew by 80 basis points to 24.9 and our utilisation went up to 82.5 which is a high for us in the last several years. We managed to address key factors that contributed to a less than desirable performance we had in Q1. We have managed to arrest degrowth in consulting, BPO and Finnacle and parts of our India business,’’ he said. At the end of the last fiscal, Infosys had in fact projected a revenue growth of 11.5 to 13.5 per cent band at June 30, 2016 currency rates. “Based on the visibility we have, we mentioned some of the client behaviour related matters such as RBS and the decline we had and some other client specific things and that is what has contributed to the outlook for the remainder of the year,’’ Sikka said. “On guidance our belief is to have as little asymmetry of information as possible between what the management sees and what we share with the market. We operate our business in a dual volatile atmosphere — one is on the transformation of the company based on what is going on in the industry and the other is what happens in the outside world,’’ Sikka said. Among the factors that contributed to Infosys’ improved performance in the second quarter, according to the management, was a one-off GST related computer automation deal which saw revenues from India spike at 3.4 per cent against 2.7 per cent last quarter. It also reported winning big deals worth around $1.2 billion in Q2 against wins in the range of $880 million last quarter. “Longer-term, I believe it’s increasingly clear that our industry’s future lies in evolving from a cost-based, people-only model, to one in which people are amplified by software and AI, and are freed to innovate in areas that are strategic to our clients’ future. And in this all-important transformation, I am glad to see us make continued progress,” Sikka said. “Our margins expanded during the quarter on the back of further improvement in operational efficiency,” said MD Ranganath, CFO. “Operating cash flows for the quarter were healthy and we effectively navigated a volatile currency environment through prudent hedging.” On the IFRS dollar basis, revenues were $2,587 million for the quarter ended September 2016, showing a year-on-year growth of 8.2 per cent in reported terms 8.9 per cent in constant currency terms. Net profit was $ 539 million for the quarter ended September, a 3.8 per cent Y-o-Y growth.